Two of the members of The Long Riders' Guild, Albert Knaus (left) and Kerstin Hüllmandel (right), highlight the renewed popularity in this new millennium of pilgrimages to Santiago de Compostela in the north-west corner of Spain. The Way of St. James is one of Europe's most ancient pilgrim routes. Various roads, tracks and trails criss-cross Europe, all converging at the cathedral in Santiago where the apostle Saint James is said to have been laid to rest. Though originally associated with Christianity, the pilgrimage itself has taken on a wider spiritual meaning to people of various faiths who travel there from all over the world, creating an unusual symbiosis between religion, art, culture and tradition. In 1982 there were an estimated 120 people who made the pilgrimage to Santiago. In 2005 there were approximately half a million pilgrims! Throughout the ages, the majority of pilgrims have made this journey on foot. However, as Albert and Kerstin demonstrate, there is a strong equestrian tradition of Long Riders travelling to Santiago on horseback. Albert and Kerstin rode 1,500 miles from their home in Mönchsondheim in Germany to Santiago. German-speakers can learn more about the journey of these two Wanderreiters (Long Riders) by visiting their website here. Babette Gallard and Paul Chinn made the pilgrimage from Le Puy en Velay in France in 2005. 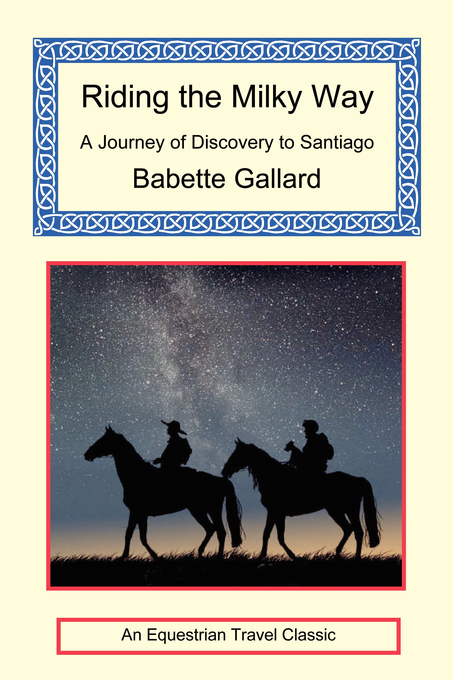 Babette's book, Riding the Milky Way, is a must-read for anybody planning a journey of their own. The Long Riders' Guild has strong ties to the Way of Saint James. Founder Members Robin and Louella Hanbury-Tenison rode to Santiago in 1989, and Robin's classic book, Spanish Pilgrimage, movingly documents their journey. 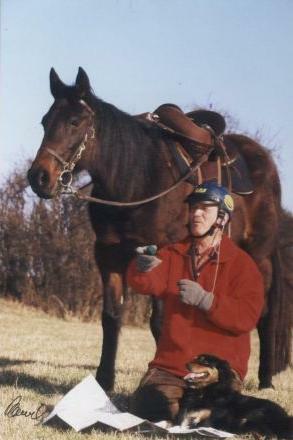 The most travelled Long Rider in the twentieth century, Otto Schwarz, rode to Santiago from his home in Switzerland in 1982. 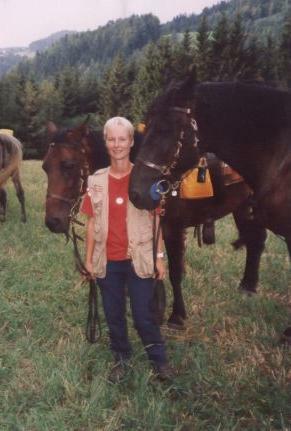 Otto writes about this journey in his book, Reisen mit dem Pferd. 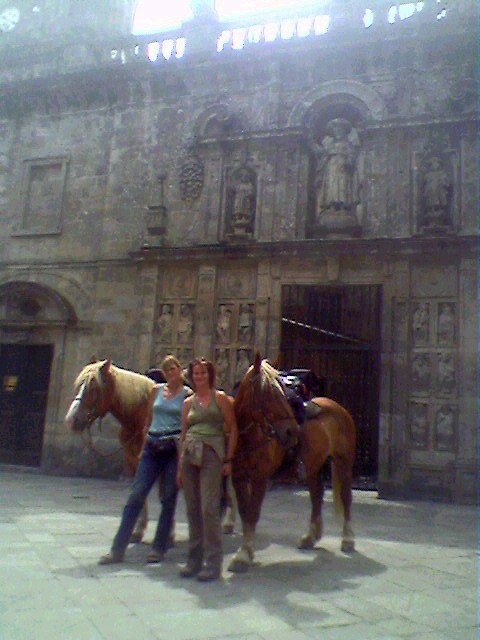 Two British Members of The Guild, Mefo Phillips and her sister, Susie Gray, rode to Santiago in the summer of 2004. In 2006 Margriet Dijkstra and Jeannette van der Eng rode there from their home in the Netherlands. All of these Long Riders confirm the importance of the route, which was declared the first European Cultural Route by the Council of Europe in October 1987 and inscribed as one of UNESCO's World Heritage Sites in 1993. 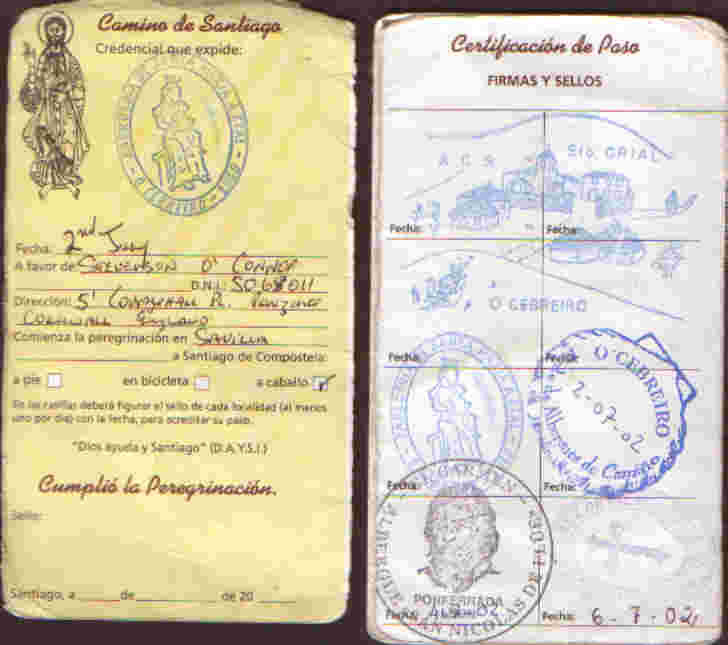 The credencial, a distant successor to the safe-conducts issued to medieval pilgrims, is a document printed and issued by the cathedral authorities in Santiago, and made available to bona fide pilgrims at points along the route - e.g. at Roncesvalles, and at some churches and refugios - and through the Spanish associations. It presupposes that the bearer is making the pilgrimage for spiritual reasons. This does not necessarily mean Roman Catholic, and pilgrims will not be asked about their denomination, or even whether they are Christian, although of course historically the pilgrimage itself has meant Christian pilgrimage. Today and in practice, however, the credencial covers anyone making the pilgrimage in a frame of mind that is open and searching. Click on picture to enlarge Steven's credencial. We were there because it was on our way home, from Seville to Penzance albeit a little out of our way. I was inspired after reading Robin Hanbury-Tenison’s account of the trail in his book Spanish Pilgrimage: A Canter to St James and thought it would be a nice thing to do on our way home. I am grateful to him for the inspiration, it turned out to be a very rewarding experience. 44 days later, having survived some hairy moments along the way, we followed the northern Portuguese Camino into the hearth of Santiago. I felt strangely deflated as we entered the square in front of one of the most famous Cathedrals in the world. I think it might have had something to do with how I had built up Santiago in my mind. I was expecting to see a walled medieval Citadel, instead we had entered through a sprawl of not very inspiring modern buildings. I have to admit once we got near the Cathedral itself in the old part of the city things improved. The only problem was the crowds of tourists, we spent about half an hour in the square, most of it having our photo taken, we must have looked a bit out of place. I did not go into the Cathedral which might seem a bit strange to some people, considering how far we had trekked to get there. All that aside reaching Santiago was a big psychological turning point for me. Up until then I felt we had been heading away from home, now we were turning for home, it felt good! Over the past weeks we had spent a lot of time on our own, that was about to change in a big way. Our first taste of what was to come came later that afternoon on the outskirts of Santiago, when we reached the ‘Albergue’ ‘ Refugio’ Monte del Gozo. It is the last one on the Camino de Santiago, but of course it was our first, as we were heading for Roncesvalle. There were a lot of people staying at the Albergue it felt a bit odd having to spend the night with so many people, Murphy was enjoying himself as he was the centre of attention: he knows how to play to the audience. I saw people with bleeding feet being looked after by kind hearted volunteers in the Albergue’s; one day an elderly oriental couple passed us arm in arm, determination etched on their faces. On another day a vision approached - at least it looked that way, in fact it was a Friar complete with sandaled feet. It was is if he had stepped out of the mist of time. On July the 4th I met an American chap in Villafranca who was riding a bicycle to Santiago, he did not realise it was Independence day until I told him. We chatted for ages before he sped off: he was on a tight schedule. One of the funniest incidents on the trail was bumping into a Japanese film crew. I had a sleep after lunch and had just got under way. It was 3pm, we were walking up the road when a small coach came down the road going the other way: the occupants were having a good look at us so I gave them a wave. A few minutes later it came up the road, passed us, stopped some way up and reversed across the trail, people started getting out. As we approached I saw what turned out to be a tripod with a camera on it, they seemed to be filming us. I thought to myself, I will just keep going. As we approached one of them, a young woman on crutches, addressed me in Spanish I said no Española, Ingles, she immediately broke into English. She asked if I would give an interview, they were making a documentary about the Camino. She asked me about all the gear Murphy was carrying etc. and why we were doing the pilgrimage. I told her our story in about ten minutes, we were to bump into them a couple of times over the next few days. To this day I do not know if we featured in their documentary. We met with new Long Riders Mefo Phillips and sister Susie on their trek from Canterbury to Santiago. In a remote village, Hontonas, I met a Danny Diveto lookalike who drinks wine by pouring it onto his forehead and letting it run down between his eyebrows on to his upper lip then into his mouth without spilling a drop, it seems he is famous for it. I should have shown him my trick of drinking a pint whilst standing on my head! In a village near Burgos we met an Italian, Fabian Zambelli. He, like ourselves, started his trek in Seville, he followed the Camino Via de la Plata, we trekked the remainder of the Camino to Roncesvalles together, it was his second time walking the Camino de Santiago. He was a pleasant companion, he also spoke Spanish which was a great help. I feel privileged to have met so many wonderful and helpful people on the trail, to have had the opportunity of trekking such an historic trail. The experience that is the Camino was summed up for me one evening while chatting with a pilgrim in one of the Albergue’s, she said the Camino becomes “As your Life.” For me it had true meaning, I was walking against the flow, it is something I have done all my life, it is not an easy path! If you get a chance to trek the Camino I strongly urge you to do so!"